Launching a new product, without the product. Zeiss develops a wide range of microscopes from traditional to the most powerful scanning electron microscopes. Zeiss contracted TR Design to create a powerful and memorable launch of their revolutionary new product ORION, the world’s first helium ion microscope. Given the center of the company’s 70’ x 60’ booth to work with, TR Design was tasked with developing a booth experience for the event that would be as groundbreaking as their new product. One caveat—they were not going to be able to have the product at the show. There were several distinct, yet complementary aspects to the exhibit plan we developed. Since we were unable to have the product at the show, we developed a scale model of ORION, which we encased in a rotating glass tube that revealed the model, as if it had been teleported to the event for our viewing. Provide sales representatives space for conversations. We created 3 pods that radiated from the center like spokes on a wheel. The two outside pods were dedicated demo stations for the company’s salespeople to perform laptop presentations. The center pod is where we presented the ORION Experience, an engaging and educational presentation of this ground-breaking helium-ion technology. The immersive user experience took the viewer on simulated journey inside the ORION microscope while a scan was being performed. 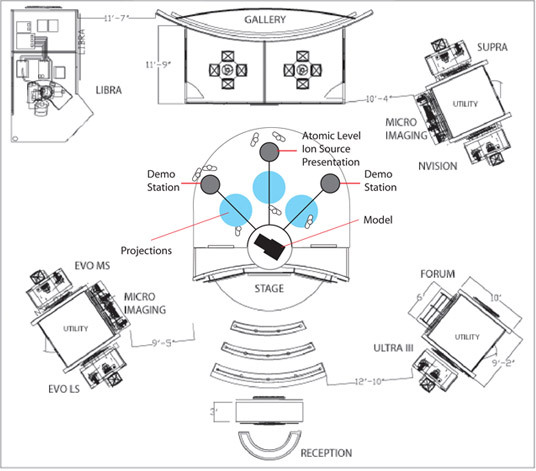 A telephone booth-sized pod contained three projection screens—one above the viewer, one in front, and a third below. We produced a synchronized three-screen video that directed the viewer to look up to see what was happening with the helium-ion beam, straight ahead for the narrative, and below to see the resulting scans. TR Design managed the creative execution of the event, including art direction of the exhibit company, securing the talent, directing videography, selecting music, overseeing final editing of the ORION Experience video, developing the looping animations for the booth walls, creating booth graphics and pre-show invitations, and art direction of the model construction. 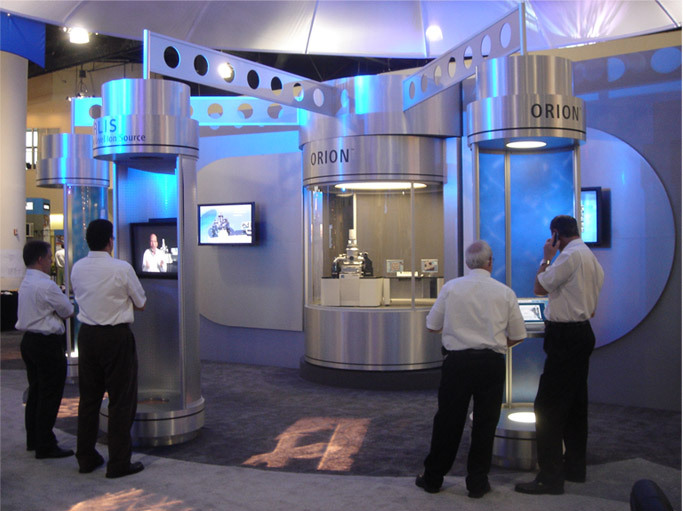 This three screen video appeared in the ORION pod shown in the photo above. Three screens within the pod projected in front, above and below the viewer. A looping animation which appeared on one screen within the Zeiss booth promoting ORION’s key features and benefits. This project took advantage of the wide array of skills and resources we have available to us at TR Design. 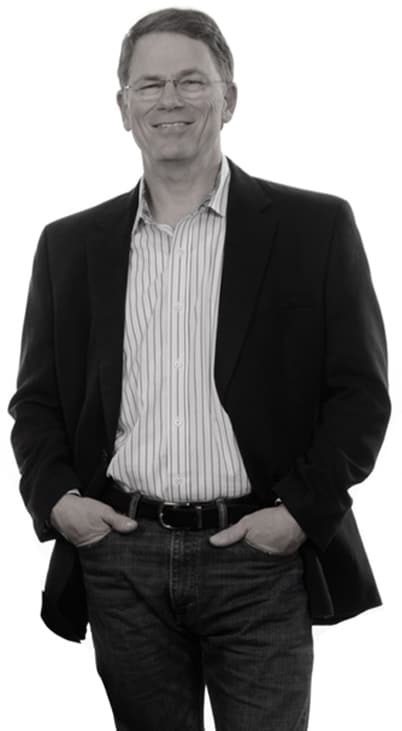 It began by developing a clear understanding of the client’s objectives and technology messages. We presented multiple creative concepts and a range of budget options. 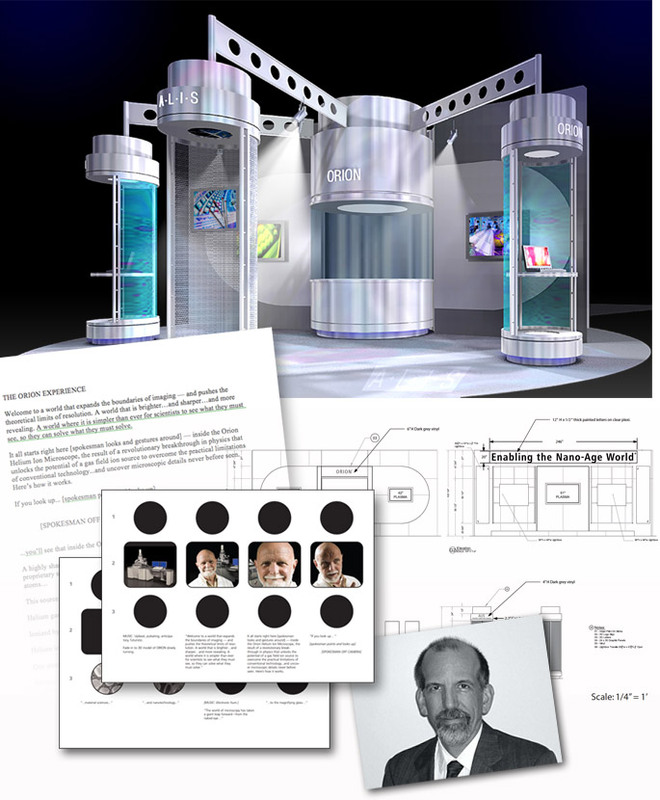 Once the direction had been agreed upon, we assembled a team of creatives to assist with various aspects of the project, engaged with the client’s event company to direct the design and manufacturing of the booth elements, and oversaw every detail in the development and execution of this wildly successful launch.